Find all GEM Utility vehicles in New Jersey. Polaris is a well-known company involved in different adventurous and outdoor industries. From its start as a mechanical shop, it has grown into one of the world’s largest Powersports companies, and has also recently expanded into the production of commercial and military vehicles. The company has a diverse portfolio of products that include all-terrain vehicles, side-by-side vehicles, snowmobiles/bikes, mid-size and heavyweight motorcycles, commercial utility vehicles, and light-duty haulers. To date, the company employs more than 8,000 people and is visible in more than 100 countries worldwide. The Gem is Polaris’ line of utility golf cars that the company has positioned and designed to be a cross between a golf cart, van, or even truck. 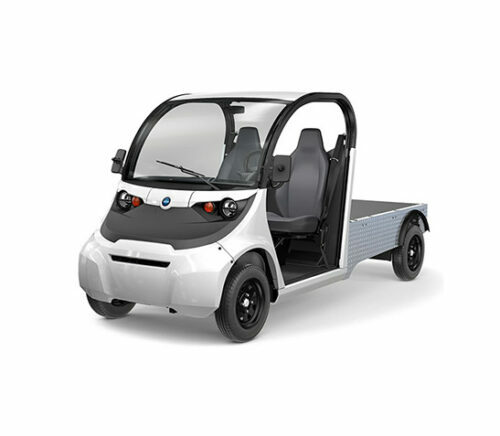 It boasts of optimum comfort, more built-in safety features than a regular golf cart, and are more economical and sustainable compared to a van or truck. Browse our wide range of Gem utility golf cars today! For any inquiries or concerns, feel free to drop a note in our site and we would be more than happy to assist you. The M1400 is a small yet sturdy 2-seater automobile that comes with a powerful engine that allows it to tow a mammoth load of 1500 lbs. The modern rugged build has been designed keeping in mind space and comfort as well while the smart and technologically advanced features of the M1400 provide a pleasurable driving experience. You can now also look cool while transporting your cargo around town efficiently. You are looking for a modern and comfortable golf car. If you are in the market for a compact, beautiful, and powerful golf cart, then the Gem e2 might be right for you. Its well-built, compact body, and bucket seats are guaranteed to provide you a comfortable ride whether in the golf course or in your hometown. Another plus factor to this baby is its 6.7 HP motor that allows it to easily reach 25mph, and versatile battery and charging options that lets you choose the best ones to fit your range requirements. You are looking for a sleek, customizable carrier. The Gem EL XD is a powerful cargo carrier that does not compromise speed and even aesthetic. It has a payload of 1,400 lbs., an 8.7 HP motor, and customizable carrier and bed options – which allows you to adapt it to your needs. You are looking for a rugged low speed vehicle with an impressive payload capacity. Heavy haulers will love the Gem em 1400 and the Gem em 1400 – Box sides. Both models come with 7 HP AC motors that allow them to reach a top speed of 19mph, state-of-the-art suspension, and braking system. The two models differ in terms of payload capacity, with the Gem em 1400 – Box sides having the bigger capacity at 1,400 lbs. over the Gem em 1400’s 1,200 lbs. At the same time, the former also offers the option of a steel flat bed to help you with your hauling needs. You are looking for a sturdy 2-seater LSV with a huge payload capability. The M1400’s payload capacity of 1,500 lbs. beats out even the Gem em 1400’s 1,400 lbs. It is a small, yet sturdy two-seater that has a 7 HP AC motor under its hood, a steel flat bed, and a rugged feel. It promises to give you a comfortable and pleasurable ride, while also transporting everything you might need. You intend to cover long distances with your LSV. Polaris’ Gem M1400, and both Gem em 1400 models can cover up to 45 miles (72km) on a single charge – perfect for neighborhood driving and even short errands to the city. You prioritize safety. Of course, anyone who is in the market for a vehicle would take note of its safety features, even if it were a low speed vehicle. All Gem models use either a 4-wheel disc brake system or disc/hydraulic brakes, and 3-point safety belts. All these plus its all-bucket seats make the Gem models safe and comfortable rides.